Back when air purifiers were a novelty item, you’d see a sharper image and only actually being used by the chronically ill or Germophobes, those days are long gone. Today most people understand that the presence of allergens and pollutants in their home can cause real health problems. Nowadays sales of home purifiers are at an all-time high. In this article, we will present you the top air purifiers on the market in 2019, regardless of whether you’re looking for the budget option or for the best of the best. We have selected one for each category and hopefully, we will secure one for you. In today’s often polluted environment, it can be hard to breathe sometimes. If you suffer from allergies, asthma, or just appreciate having clean air. Here are the best air purifiers in 2019 on the market. Subsequently, in this article, we break down the top 10 best ones. Based on the price, versus performance and various situations they’ll be used in. There are many other factors we took into considerations while creating this detailed article, such as reviews, feedback, and our readers’ suggestions and experience. 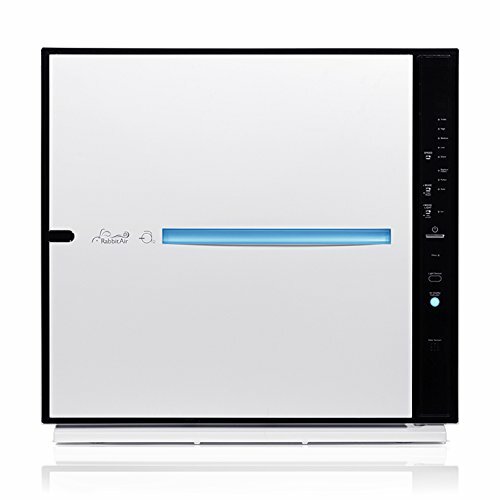 First on our official list is ‘IQ Air Healthpro plus’ air purifier, the IQ Air health pro plus is the best air purifier available for those suffering from allergies, asthma, and chemical sensitivities. It is widely used in hospitals and other medical facilities, it was famously used to help control the 2003 SARS outbreak in Hong Kong, IQ Air has also been selected by the American Lung Association. As its sole educational partner in the air purifier industry. the Hyper-HEPA filter, and forced state filtration system in this air purifier, work to remove ultrafine particles as small as point zero three microns. performance even more compared to the past, the controls on the unit are extremely easy to operate from either the machine itself or the remote control. With complete pre-programming options, as well as status and filter life indicators. With the most powerful fan in the units we have highlighted here, this air purifier delivers more clean air per minute than any other competitive purifiers. But at a pretty steep price, the IQ air is quite pricey and requires the expensive pre-filter, odor, and Hyper-HEPA filter getting changed regularly. Moreover is not very energy-efficient, and those costs don’t normally cover an entire home. The coverage area for the Healthpro plus is approximately 1,000 square feet, so it’s only suitable for a vast room or apartment use. Unless you live in a small house. Overall this IQ Air purifier is a great choice, but only if you can justify the cost. Those who are buying an air purifier for medical reasons are most likely to appreciate the Healthpro plus, despite its high price. Suitable for those who have chemical sensitivities. Not affordable for some people. The Alen breathe smart HEPA air purifier doesn’t filter the smallest particles in your home quite effectively as the IQ air because it uses a standard HEPA filter, additionally, it doesn’t have a separate odor filter. Nevertheless, it will almost remove all of the common contaminants, which cause common health and breathing problems. From an area up to 1,100 square feet at a lower price than the Healthpro plus. Its CADR rating which measures the removal of contaminants is among the highest of all purifiers on the market. 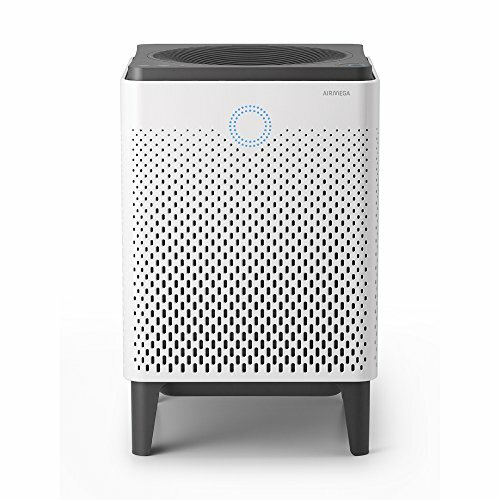 One excellent feature of the Alen model is its intuitive smart sensor, which can continuously sense the amount of pollution in the air and adjust the fan accordingly, you can also operate the unit in timed or manual modes to save energy, although this air purifier is Energy Star certified. Furthermore, it also comes with a night setting, which lowers both the fan speed to reduce the noise and the brightness of the LED indicators. There’s also a filter monitor, one feature that you should know about is the breath Smart’s optional ionizing unit ,the latter remains a controversial subject, atoms that have been charged by the ionizer can more efficiently trap air particles, But ionized air can also cause breathing problems for those with sensitive or compromised lungs. The ionizer on the Alen can be easily turned off, though, if you prefer you can operate the unit without it. Overall, this air purifier is very effective and a good choice for those concerned about their health, and the quality of the air they breathe, but not suffering from serious chemical sensitivities or allergies. it‘s equally attractive, with a high-tech look and 7 front color panels to choose from. Smart sensor for the amount of pollution. The rabbit air is a good compromise air purifier. It only provides maximum coverage for rooms up to 350 square feet. and can only cover 700 square feet at less effective operating levels. But is usually cheaper, compared to the Allan breed smart. It offers customizable filter options allowing you to specifically target the purification system, at toxins, germs, odors, or pet dander. If any of those issues are a major concern for you or your family, you may be willing to compromise on the purifiers coverage area and price. There’s no compromise on the quality of the – a 2’s performance. However, there are five other filters built into the system including a HEPA filter, and an activated carbon filter. Working in tandem with your choice of custom filter, they carry out an outstanding job of cleaning the air particles and contaminants. There’s also an optional ionizer for the air leaving the machine, the manufacturer claims though, that it does not produce ozone. One drawback is that there is no programmable functionality with this rabbit air model. The unit is one of the quietest on our list, and the rabbit purifier is attractive and easily mountable on the wall. Overall his products delivers well when it comes to filtering specific types of pollutants or contaminants especially related to pets. Coverage upto 350 square feet. Perfect for those who have pets at home. 5 different filters to choose from. Ionizer is also an option in this purifier which might not suite sensitive lungs. 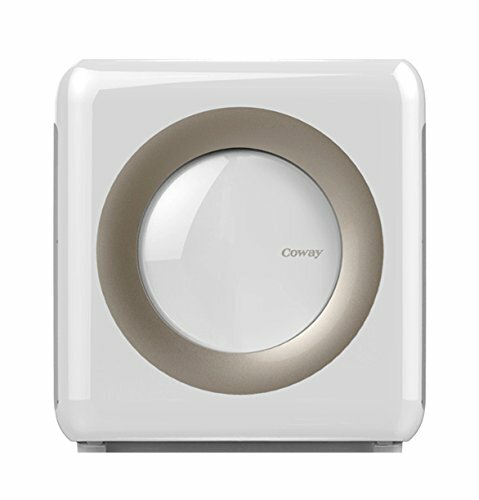 The Coway AP-1512HH is a quality smaller room air purifier, with a more palatable price. It is a compact unit designed for full operation in rooms a little bigger than 300 square feet and has a four-stage filtration system. That includes a HEPA filter to remove small particles and other contaminants, in addition to odor filter. This air purifier also uses an ionizing system, which can be turned off if desired, all of the company representers say the ozone created by the system is very minimal, and the unit has been approved by California’s strict standards. The AP-1512HH also has an air quality indicator but goes a step further than the minus ay two, by using the detected air quality automatically to increase the fan speed if needed. Last and not least, it’s very quiet compared to most competitive models. Works good in small rooms. 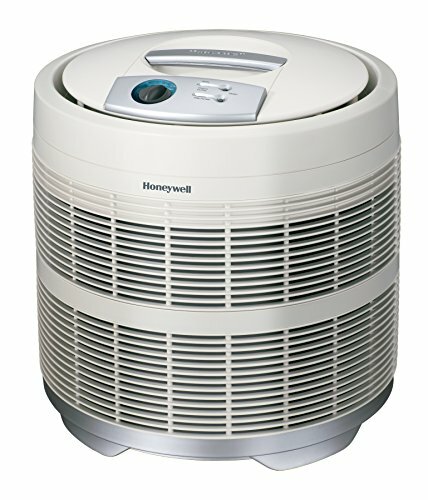 This purifier is a solid round unit HEPA certified, the Honeywell is ideal for those who want to move an expensive air purifier from one room to another if needed. In case you have a large room. If you’re looking for a powerful system to purify the air, the 50 – 50 is designed to suit your needs. This round 18 by 18 by 19 inches unit, is optimal for spaces that are as large as 390 square feet. This makes it suitable for a wide range of uses. It is perfect for use in living rooms, bedrooms, offices, labs, and more. It is slightly larger than the Coway but sells for a bargain basement price. It features a glass fiber HEPA filter, and carbon activated pre-filter for well above adequate removal of contaminants. Its round design while not particularly attractive circulates the clean air 360 degrees throughout the 390 square feet it can cover. There is no air quality monitor and the purifier is unprogrammable, However , it is equiped with a sensor that determines how many pollutants the filters have captured. There is no air quality monitor. Suitable for a wide range of use. Unique design to circulate the air 360°. If you enjoy a modern sense of style, then you’re going to love the rabbit air purifier. At first glance, it looks nothing like the traditional round shaped air purifiers and towers that you‘re used to seeing. However, if you take a look under the cover, you’ll immediately realize that it’s one of the best purifiers money can buy. One of the lasting benefits of this one is the fact that it‘s incredibly silent unless you ‘re close attention you will barely realize that it‘s turned on. Compare this to your traditional air purifiers which can sometimes be as loud as industrial fans, and you’ll understand the benefit of a silent unit. Along with its sleek and modern design, the rabbit air is extremely energy efficient. The system will never continuously run and cost money, like the clunky old-school units used to do. If you require clean air to breathe, you don’t have to spend an arm and a leg on power. The one drawback of this air purifier is that you‘ll likely want to pick up a few extra filters, there have been several complaints that the stock filters decrease the efficiency of the machine. Luckily these are fairly cheap and can be purchased on Amazon along with your purifier. Save you the money and runs only when it has to. Extra filters are required to buy separately. Maybe you‘re not looking for the high-profile expensive air purifier, but instead, you want something that will give you the best bang for your buck, then the Honeywell true allergen removing air purifier will not disappoint you. The first benefit of this machine is its sublime speed. It may look a little bit large and clunky, but it can recycle the Aeron room five times per hour. This is well up to standards set by more expensive units, and it’s just over 200 bucks. As you’ve probably guessed it by now, this is a great deal. Many purifiers that are in the 600 to 800 dollar range, can’t even flow this quickly. Another neat feature is that this one has four different air cleaning levels. You can go with the general clean mode, or allergen and turbo clean mode for when you’re handling something really bad. The benefit of this is enabling the customer to control the amount of energy that’s being used by the air purifier, However, Honeywell’s main selling point for this unit, is their advanced HEPA air filter. It’s been lab proven to reduce allergens in the air by 99.7%. Which is a huge plus and can be a lifesaver for those who suffer from seasonal allergies. The speed performance is remarkable. different cleaning levels are available. Next up we have the Air Mega 300 the smarter air purifier, there have been many debates and controversies as to whether air purifiers actually do what they claim to do, while some people report that it’s a huge difference, others state that the air purifier they used made little to no difference in their homes. With the Air Mega 300, you’ll be able to see your air purifier doing the job it is supposed to do, with a built-in real-time air quality monitoring system, a bright LED ring light on the front of the unit will tell you whether the air is fresh, or if there is a need for improvement. This brings us to our next point, the smart move, this air purifier will automatically adjust the air filtration speed and power according to the current level of air quality in the room, this means that you won’t have to worry about it wasting power while you’re away . One final feature that’s really cool and modern about the Air Mega 300 is that if you upgrade to the 300s model, you’ll be able to synchronize it with your Android or iPhone. This will give you live updates about the quality of your air, and allow you to change the settings accordingly,quickly, and efficiently. LED light detector of clean air. If you’re looking for the ultimate compact air purifier under $100, the Germ Guardian air purifier is a great option for you to consider. It is rated to perform most effectively in small to medium-sized rooms which makes it the excellent personal unit. The Germ Guardian works based on its three-in-one system, it utilizes three separate methods of filtration to ensure that the air is as clean as possible. The first filter is charcoal pre-filter, this filter catches large dust particles, such as pet hair drifting dirt, while the charcoal helps to absorb the odors in the room. The second one is a true HEPA filter which can capture just about any other form of dust from pollen to dust mites. The only things that can‘t make it through the HEPA layer are germs and viruses, in order to combat this Guardian implemented a UVC light for the final means of filtration, this high-frequency blue light can kill most major viruses and bacteria found floating in the average home. not suitable for bigger rooms. 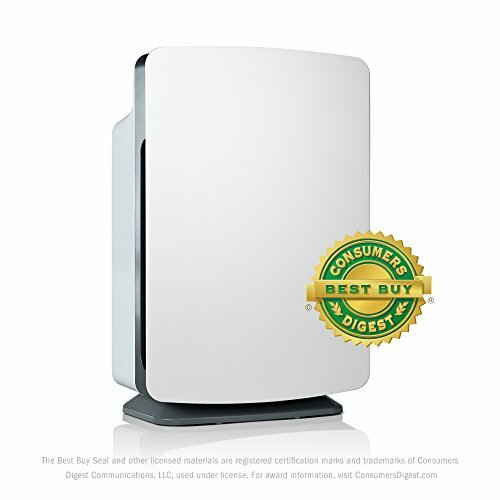 Last but absolutely not least, is the AP-Mighty air purifier, the Coway is the perfect middle-of-the-road air purifier that’s great for small to medium-sized rooms. For its compact size, this unit is incredibly powerful and comes loaded with smart features that will save you energy,as well as he, lp keep your air as clean as possible. It features a four-step filtering process similar to the Germ Guardian, it has a washable pre-filter for thick dust. A carbon activated odor filter, it also comes with a filter that can even shop cigarette and smoke, and finally an ionizer. The ionizer boosts the machines cleaning power and helps to kill germs and other microscopic dust particles.M oreover, the Coway Mighty features a handy eco mode, which prevents the machine from constantly running. The system constantly monitors and measures air quality, so if there is no sign of pollution detected for a duration of thirty minutes,the air purifier will automatically shut off to save electricity. One of the things we really appreciate about this air purifier is how cool it looks, it resembles something that came out of a science fiction movie, The curved edges and sharply defined vents make for a modern space saving design. Gets louder when it’s working at full speed. Have you thought how important it is to breathe clean and fresh air? You can survive 21 days without food, five days without water. but only three minutes without air. In order to live each day, we need 0.5 kilograms of food, 2 liters of water, and 10 kilograms of air. That just goes to show you how crucial fresh air is to our survival. Breathing clean air is vital to our health and well-being, according to the latest air urban quality database 98% of cities in low and middle-income countries with more than 100,000 inhabitants, do not meet World Health Organization (WHO) air quality guidelines. However, in high-income countries that percentage decreases to 56%. In the past two years, the database now covering 3000 cities in 103 countries has nearly doubled, with more cities measuring air pollution levels and recognizing the associated health impacts. As urban air quality declines the risk of the following increases drastically, stroke, heart disease, lung cancer, and chronic and acute respiratory diseases including asthma. Air pollution is a major cause of disease and death, the latter has risen by 8 percent globally in the past five years. The latest data collected reveals that there is now a certain culture being formed around the world, wherein citizens resort to the usage of mobile applications that help them monitor the air quality of frequent intervals. Masked motorists and pedestrians across busy cities are not an irregular site these days, blue air has introduced a free-to-use tool, called air view. According to the World Health Organization, but how can you see an invisible problem. Air view is a service that gives you the facts about the air you’re breathing, right here right now. It’s simple to search the address you want to see 360-degree images from Google Street View, will give you the real experience of what the air actually looks like right now. Do you think the problem is only outdoors today? have you thought about the quality of the air we breathe indoors? Not far from now we could imagine all our homes and offices to be like this. So why do you need an air purifier at home? let’s see some data studies who which suggest that invisible contaminants in indoor air at homes and workplaces are actually making us sick. Furthermore, indoor air levels of air pollutants can be two to five times higher and occasionally 100 times higher than outdoor levels. The most common indoor hazard in the Middle East is SPS or sick building syndrome. Primary sources are inadequate ventilation, chemical contamination from indoor and outdoor sources. Let’s observe a few indoor pollution scenarios. Typically in a living room, you’re most likely to witness the dust, bacteria, pollen, dust mites, pet dander, and mold, these fine particles in the air, which are 2.5 micrometers or less are known as PM 2.5. Looking into a typical kitchen, we would witness cooking odors, fumes and other chemicals which are volatile organic compounds. And if we take a look at our offices, we would come across dust, bacteria, pollen, and dust mites. 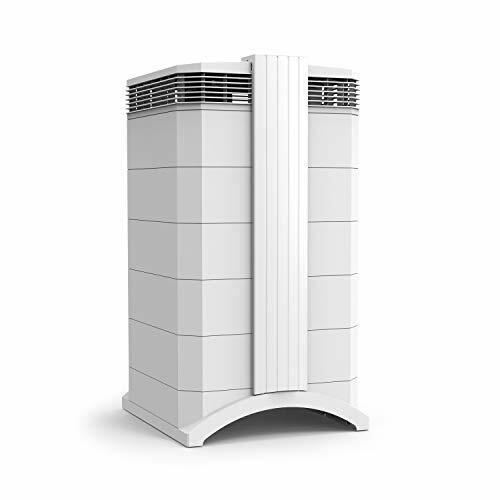 Plus smoke and other chemicals at our office patios, it is becoming increasingly difficult to live and work in a clean air environment, that’s why it is recommended to use the best air purifier to create a healthy environment. We believe that clean air is a basic human right, a convention taken to the edge with the benefits and importance of clean air. Revolutionizing air cleaning technology of your home, that is constantly being bombarded by pollutants, by being able to keep it continuously clean at a higher rate, thanks to the patented HEPA silent technology the world is able today to enjoy a fresher,allergen-free and proper breathing environment. That’s why a purifier that guarantees low noise and low energy consumption is required, air is drawn into the purifier and into the ion chamber along with every airborne particle. 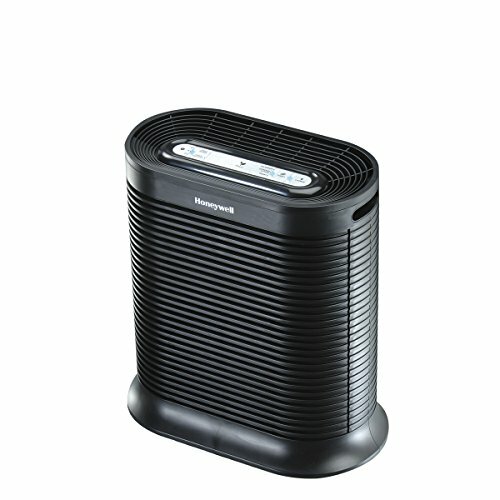 So buy one for your home or office and ensure that pollutants are trapped inside the air purifier with high efficiency. 10Giants is a participant in the Amazon Services LLC Associates Program, and we get a commission on purchases made through our links.